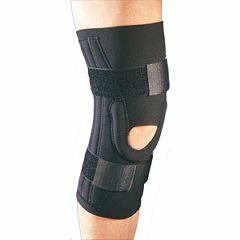 The Bell-Horn ProStyle Stabilized Knee supports are designed to give you the comfort of an elastic support with the therapeutic properties of heat, without the perspiration associated with neoprene. Recommended for swollen or tender knees resulting from: sprains, strains, sports injuries or post-operative rehab. Offers treatment for Osgood-Schlatter Disease as well as patellar instability. Good Knee Support. Little to no perspiration. Great Product with ease of use. I should not have bought this product. Needed some knee support. Average Health. I can't use the product. I ordered according to the measuring guide and found I could not pull it up over my swollen knee. The solid construction - i.e. pull up rather than wrap around - is a BIG MINUS. I am waiting for a return authorization so I can send it back.